Assisted Dying Polls: Well covered terrain | Jenkins Research Inc. 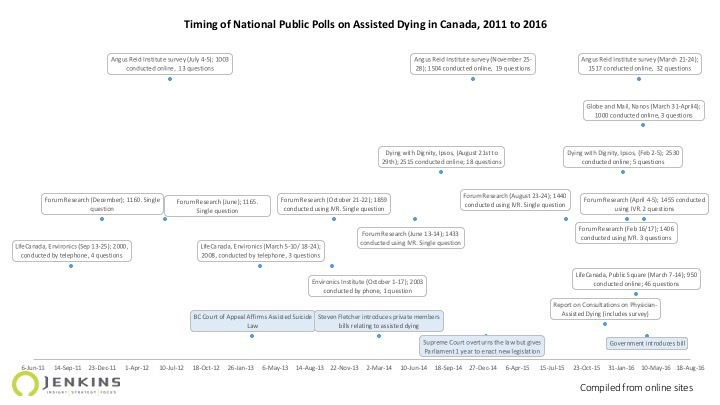 Assisted dying is a well polled issue in 2016; 6 polls have been released in 2016 in addition to the report from the External Panel on Options for a Legislative Response to Carter v. Canada, which included public consultation results. In fact, since 2011 there have been 17 public opinion releases on the topic of assisted dying and 5 of these have been sponsored by groups that are clearly positioned on the debate. Other releases may have been sponsored but the publicly available information is limited. A longer trend view of the evolution of public opinion is available in an earlier post.